Not sure if this has been finalized but a nice feature for porters was added by David. Port mach numbers one of the secrets many big boys keep to themselves. Now even an electrician can come closer to a powerful design. I like that it includes peak hp and shift rpm. This thread is full of interesting info, thank you to Charlie for doing this and all who posted along the way with info. 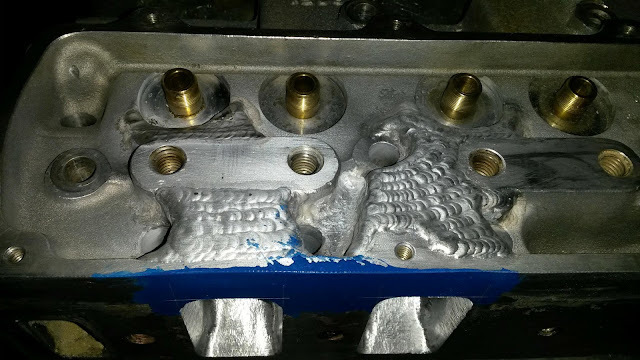 The exhaust valve shape change taking care of a problem area shows how you can tune a port with a valve, and sometimes save a headache or hitting water trying to fix an area. Good stuff and a long thread to read! I really need to finish these up after the 66 289 heads. I wonder how much info transfers? After recent wins and losses I bet I will look at these with different eyes. Wouldn't it be more relevant to base the Mach Number on the minimum port area? With the same MCSA, a long high-taper runner/port will have a significantly greater mean port area and thus by the chart a higher Mach # than a zero-taper one. I say, call them done, put together a nice short block, and go to the dyno, that's the next step. Theory and jiving numbers non stop won't take you to the next level until you put them on something and run them. Frankshaft wrote: I say, call them done, put together a nice short block, and go to the dyno, that's the next step. Theory and jiving numbers non stop won't take you to the next level until you put them on something and run them. Any chance you can update these ported head threads? Either on the first post or somewhere on the last post, that is within the last few weeks? Like what is the final port volume measured, as well as the cfm numbers? It is a pain to go back 20 pages even 10 pages to get caught up on the improvements made. I do not think I have seen port measurement sizes as well as cfm measured very often. What is the final numbers on these heads without me searching the thread for them. Is what I am asking. Not knocking, just asking. Just read the next post of yours and read something about a customer on long island. Is this porting you do for your own engines, or is this a buisness that you charge customers for your porting services? One more question is , have you experimented with Gen3 and gen4 chevy Ls heads yet? S10LS2 wrote: Any chance you can update these ported head threads? Either on the first post or somewhere on the last post, that is within the last few weeks? Like what is the final port volume measured, as well as the cfm numbers? It is a pain to go back 20 pages even 10 pages to get caught up on the improvements made. I do not think I have seen port measurement sizes as well as cfm measured very often. What is the final numbers on these heads without me searching the thread for them. Is what I am asking. Not knocking, just asking. Just read the next post of yours and read something about a customer on long island. Is this porting you do for your own engines, or is this a buisness that you charge customers for your porting services? One more question is , have you experimented with Gen3 and gen4 chevy Ls heads yet? Pushing the casting and very aggressive burrs are a tough mix. Looks like a bit of welding or epoxy will be used on these! Raise that roof to the limit! Considering done this repair, will be enought thickness on the spring pocket? By the way your doing this, seems it won´t use "mild" HFT cam. Not sure if you know this trick, Carnut1, but just take some copper and push it up against that hole in the port, and then you can weld the hole shut on the top easy-peesy. The aluminum won't stick to copper and acts as a good heat sink to cool the puddle so you don't end up chasing a burn-through around.